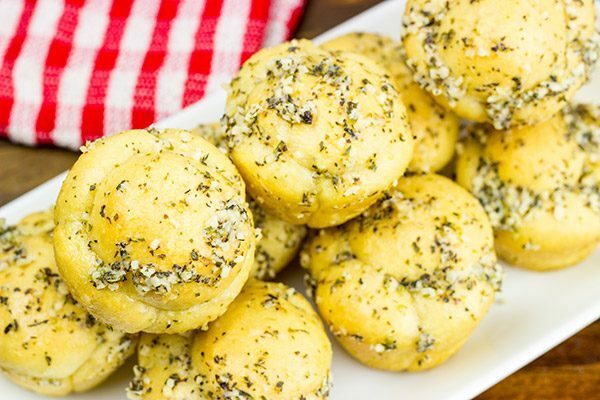 These Muffin Tin Garlic Knots are easy and delicious…and they’re the perfect game-time appetizer! I love garlic. Seriously. It’s one of my favorite ingredients to cook with. I often add a bit of minced garlic in the pan whenever I’m sauteing onions for soups, tacos, you name it. I find that it adds a nice depth of flavor to a finished dish. You don’t need to overload the pan with garlic either. I mean, you can overload the pan. Especially if you are afraid a vampire might be watching you. But just a little bit of garlic goes a long way. My friends know that I spend a lot of time in the kitchen, and every once in a while someone will ask what my favorite kitchen hack is. Easy. Pre-minced garlic. It’s my #1 kitchen hack. When I first started to learn my way around the kitchen, I used a lot of baking mixes and even some of those pre-made dinner kits. But over time, I’ve slowly migrated to making more and more from scratch. I just enjoy baking/cooking from scratch. But I don’t enjoy mincing garlic. Call it a weakness. Call me lazy. I prefer to think of myself as working ‘smarter not harder’! So while I usually just use garlic as a way to build flavors in a recipe, garlic takes center stage in these Muffin Tin Garlic Knots. I mean what’s not to love about a buttery, garlic-y, pull-apart roll? Not to mention the Italian herbs and salt that goes on top, too? But consider yourself warned: once you smell these Muffin Tin Garlic Knots, you won’t be able to resist snacking on one or six. 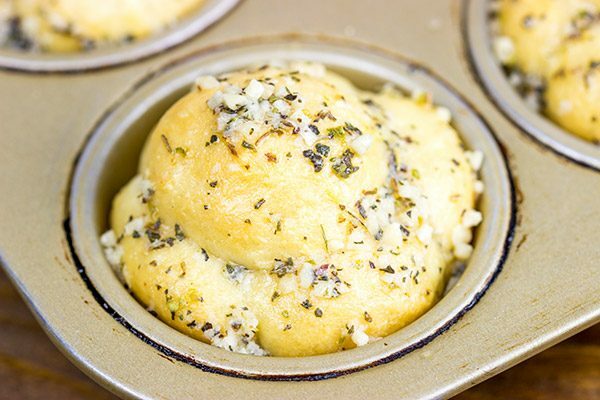 These Muffin Tin Garlic Knots would be a huge hit while watching football games. I speak from experience here. Enjoy! What are your favorite time-saving kitchen hacks? Cut each piece of dough into 5 pieces. Using a circular motion, roll each piece of dough between countertop and palm of your hand until dough ball becomes tight. Place 5 balls of dough into each muffin cup. Brush tops of dough with olive oil. Once dough has risen, bake at 350°F for 28-30 minutes, or until tops of garlic bread are lightly browned. 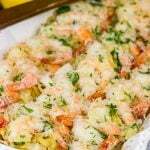 While garlic bread is baking, melt the butter and stir in the Parmesan cheese, minced garlic, Italian seasoning and kosher salt. 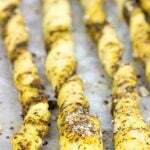 Remove garlic bread from oven and brush with the garlic butter mixture. Serve hot. I don’t mind chopping garlic and, weird fact, love the smell of it on my hands! Too funny, right? Like you, love the stuff and pretty much use it in just about everything. 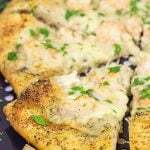 I whipped up a batch of my homemade pizza dough Friday night and if I had seen this recipe prior to I would have doubled the batch and made these. They are definitely going on my ‘to-try’ list because I do love me some bread and, plus, these look too cute. I would be poppin’ 5-6 of these and not even realizing. Pinning! Happy Monday! That is funny, Dawn! I love the smell of garlic, but I just find chopping it to be a pain since it’s so small. Maybe I’ll just employ you as my professional garlic chopper from now on! 🙂 Yes, take that homemade pizza dough recipe of yours and turn it into garlic knots. You won’t regret it one bit!! I’m a huge fan of garlic as well but I’ve actually never tried pre-minced garlic. It definitely sounds worth a try, though, since our garlic press is one of the most annoying items to wash and I really hate it when I can still smell garlic under my nails days after I last cooked with it. 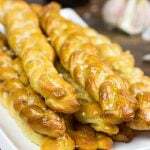 These knots look positively droolworthy! I also have a love affair with garlic, it makes everything taste soooooooo good. Cutting up garlic isn’t fun at all, my hands smell for days, good thing I love the smell of garlic lol. I have to look for pre-minced garlic next time I go grocery shopping it could save me a lot of time in the kitchen. I have this sneaky suspicion most of my Super Bowl Party Recipes will be inspired by Spicedblog, and I’m pretty freakin excited about it. 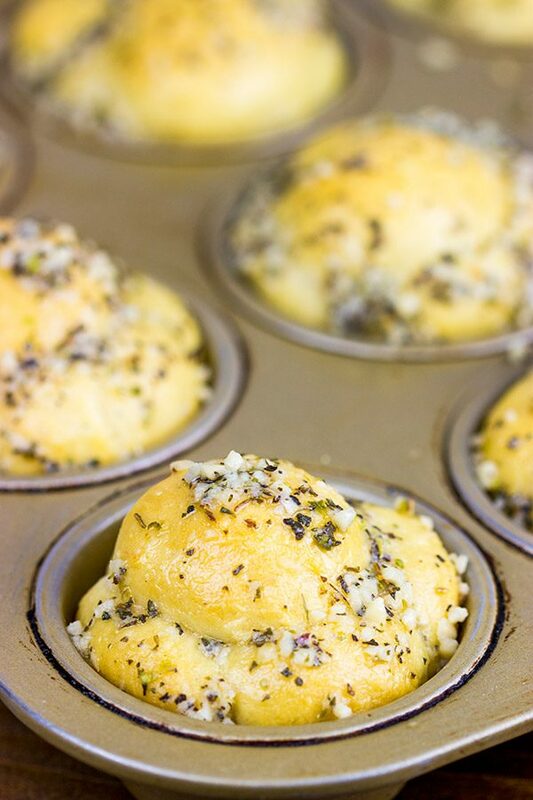 I have to make these muffin Tin Garlic knots, I mean who doesn’t love garlic bread? I know I do. Yeah, that pre-minced garlic is a life saver for me, Mary. I use garlic a lot…like a lot. Sometimes it’s just as a flavor enhancer and other times it’s the star of the show (like with these Garlic Knots). Do look for the pre-minced jars…and the best part is they are pretty inexpensive! Hey, I’m totally ok with a Super Bowl party inspired by Spicedblog. Ours will be pretty similar…funny how that works, right? 😉 Thank you SO much, Mary!! I share the garlic love David, I add it to everything too! These look so good, great idea to use the muffin tin! yum! Yes, yes, my secret is out there now. I use pre-minced garlic. I know a chef’s knife will make quick work of that garlic. But it’s a pain. And peeling it is a pain. So I cheat and use the pre-minced stuff. And I’m ok with that! Plus, using the pre-minced stuff meant I had these Garlic Knots out of the oven sooner…and that’s always a good thing. Haha! Thanks, Ben! Haha…great idea, Brigitte! I already have a garlic press somewhere in my kitchen drawers, but I never thought about buying the whole, pre-peeled garlic. I’ll start doing that now! 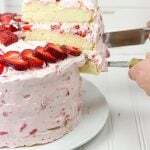 Yummy bake.. Perfect winter snack.. I love the garlicky flavour!! This is a joke between me and my sister! She buys pre minced garlic and I don’t mind cutting and smashing my own garlic!! hehehe Even though your recipe is with pre minced garlic it looks amazing! Haha…I totally stumbled into the middle of the family feud about pre-minced garlic. You should let your sister know that I support her! (I still support you, too, Gaila…just not when it comes to chopping garlic. Haha!) But feel free to chop your own garlic if you’d like here. These knots will be delicious either way! Thanks, my friend! Hi David. Garlic is such a good thing. Our friend in MI grows the best garlic and he sends us two braids every year. I am with Kevin, just smash it with your chefs knife and it’s all good. Some quality marinara sauce with these and I would be very happy. No way! Your friend sends you two braids of homegrown garlic every year? I tried growing garlic one year, but it didn’t do sell well. I probably should do a little more research and try that one again. (Plus, garlic scapes are fun to use in recipes…so that’s an added bonus!) And, yes, dip these bad boys in some marinara sauce, and you’ve got one amazing appetizer. Cheers to you and Gary…you guys doing anything crazy for the Super Bowl this year?? Rub your garlicky paws on your stainless steel sink and the odor is gone. Pre-minced is not the best quality…something must be done to keep it “fresh” in the jar. You know, you’ve got a good point there, ViVi. I’ve heard that trick about rubbing your hands on a stainless steel sink. I’ll have to give that a shot! Thanks! Mmm, I haven’t had a garlic knot in too long! So smart to make them in a muffin tin. I just used garlic infused olive oil to make pesto for a zoodle/cherry tomato dinner! Man, now you have me craving that zoodle/cheery tomato dinner, Nicole! And I actually think I have a little jar of garlic infused olive oil upstairs. That might just need to happen sooner! 🙂 But in the meantime, there’s a game to watch…and some garlic knots to eat. Yum! I love garlic too – I tried the pre-minced garlic awhile back but just couldn’t get down with it – it left me craving the real, clean-off-the-skin stuff! I just bash mine with a large knife and it separates easily and if I bash it hard enough then I don’t even have to cut it cos it’s pretty much pulp! Last summer I attended a cooking demo where chef Marc Forgione (chef where Lindsey @AmericanHeritage works at) and he simply roasted garlic alone – and dude – that smell – intoxicating! And I’ll stop rambling now – happy Tuesday! Oh man, the smell of roasted garlic. I usually roast up a ton (like a Sam’s Club sized bag of garlic) at once and then freeze it in little “garlic bomb” sized packs. But the house smells SO darned good on the days that I roast garlic. In fact, I kinda want to go roast some now…even though we still have some in the freezer. Haha! I bet roasted garlic mixed into the pizza dough would be pretty amazing for these knots! 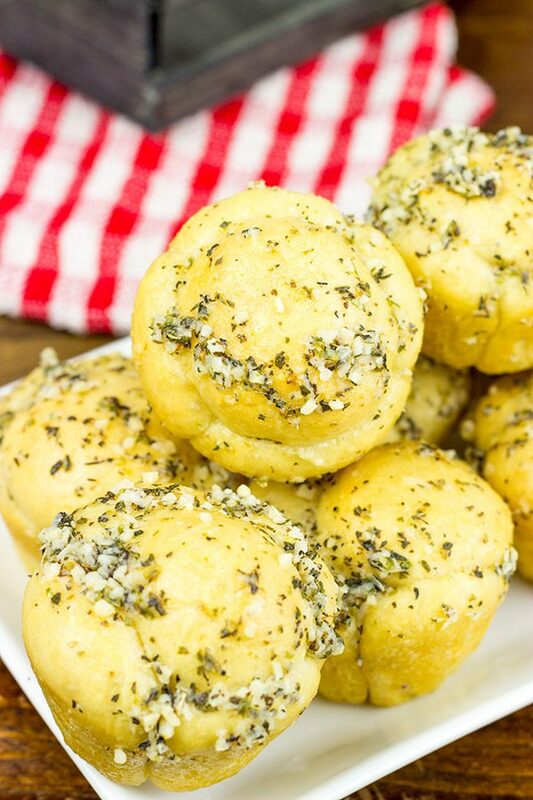 Garlic bread is one thing…garlic knots are another….Im drooling over these! The drool dripping down my face is VERY unladylike! Hahaha! 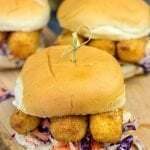 We’ll just keep your drool as our little secret. Hey, Robbie drools all the time, too, and no-one cares. (Of course, Robbie is only 14 months old…) 🙂 Thanks, GiGi! garlic is without a doubt ALMOST up there with salt and pepper. One of my childhood creations used to be a clove of garlic spread of bread with butter and sea salt. Man, I need some STAT. Actually, these would be better x 100 – Never had a garlic knot until I was upstate New York at Oswego and the pizza joint gave us some with our pies! You know, that’s a good point. I don’t use garlic as much as salt and pepper…but it’s clove! Wait. You used to eat garlic plain? Is that a Persian treat?? 🙂 Now you don’t have to drive back to Oswego to get garlic knots again, mate! Haha! Yes! Someone else that agrees with me about pre-minced garlic! 🙂 I do love garlic, but I find chopping it to be rather annoying. 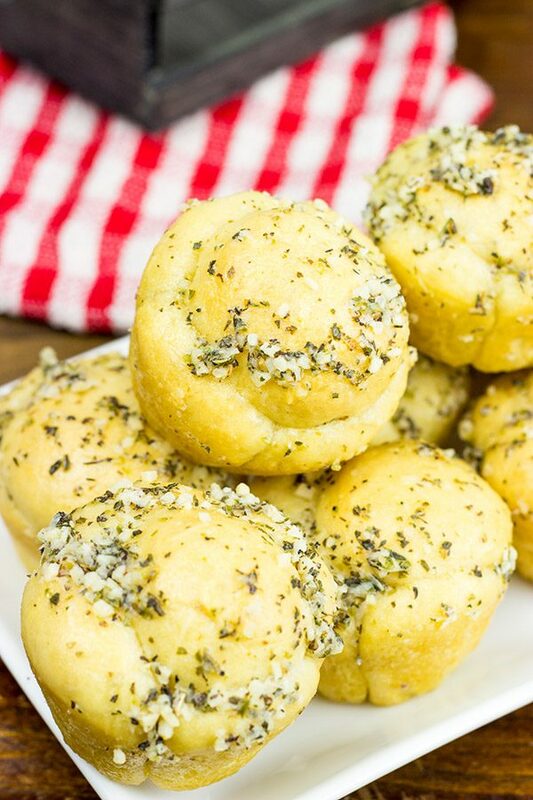 Grab a jar of garlic and make a batch of these garlic knots this weekend, Miriam! 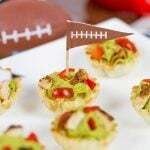 (I know you guys don’t do the Super Bowl over there, but you can still eat the Super Bowl appetizers, right? Haha!) Thanks! Can these be made the day before you need them and heated up in oven? They look incredible.